Let These Bones Live Again ($14.95, 190 pages, 6×9 Trade Paperback, ISBN: 978-1-60381-393-8) by David Carlson is a mystery / thriller, and the third book in the Christopher Worthy / Father Fortis Mystery Series. Allyson Worthy and her renowned detective father, Christopher Worthy, investigate the apparent suicides of two wealthy Americans in Venice. Meanwhile, Father Nicholas Fortis looks into the recent theft of relics from Venetian churches. An unexpected breakthrough reveals a dark undercurrent in the city just as Allyson is unexpectedly put in danger. Allyson Worthy, daughter of the renowned homicide detective Christopher Worthy always dreamt of living in Venice. Now, as a college student, she’s landed a dream internship with the Venice police. She assumes she will be investigating minor crimes perpetrated on gullible American and English tourists. On the first day of her internship, however, Allyson is assigned to assist with a more bizarre case—the apparent suicides of two wealthy Americans in the city. Linking the two persons are their similar cancer diagnoses and strange incisions on their bodies. The family of the second victim, a Detroit automaker, doubts the suicide verdict and hire Christopher Worthy to look into the death. Allyson’s relationship with her father is tenuous, and she resents his intrusion into her dream summer. 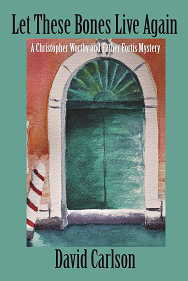 Book 3 in the Christopher Worthy / Father Fortis Mystery Series. David Carlson has a BA in political science from Wheaton College (Illinois), an M.A. from the American Baptist Seminary of the West (Biblical Theology) and a doctorate from the University of Aberdeen, Scotland (New Testament Studies). Franklin College, a traditional liberal arts college in central Indiana, has been his home for the past thirty-eight years. For more information, click here. Dom Philip looked down at this plate. With his fork, he dragged the few remaining pieces of linguini together, but then seemed to lose interest. Father Fortis’ thoughts were spinning. To visit Venice before returning to his Ohio monastery was always part of his plans. He promised his close friend Lt. Christopher Worthy that he would visit his daughter Allyson, who was beginning an internship in that city. In addition, he knew Venice to be the most Byzantine of the Italian cities and suspected that he would never again have such a chance to see the treasures of the famous city. “Relics? But why?” Father Fortis asked. Father Fortis took more than a sip of the wine and considered what Dom Philip was saying. The stealing of relics was a major activity in the Middle Ages, as was the false “finding” and selling of relics associated with famous saints. But in a secular age that found holiness to be far less important than success, relics became, at best, curiosities for tourists. Father Fortis imagined that the Vatican has about as many “friends” around the world as the CIA.